Patriots vs. Dolphins: Who Has the Facebook Edge? Monday Night Football kicks off tonight with a big game between the New England Patriots and Miami Dolphins. Being based in Boston, we couldn’t resist pitting the two teams against one another on Facebook. Who has a larger fanbase reach? Which team has older fans? Are their gender differences between fans? And what portion of the team’s fanbase are from the other team’s home state? However, this does not necessarily paint the full picture. For example, while someone may not actively “Like” the New England Patriots fan page, they could list “NE Pats” as an interest on their profile. We tapped into our Facebook advertising platform to drill into more representative reach numbers by aggregating similar Likes and interests into groups (e.g., NE Pats, Patriots Football, etc.). Beyond this, we were able to drill into the demographic composition of each team’s fanbase. Given the NFL’s presence in the US, we limited our age, gender and location analysis to only those based in North America. The results: the Patriots’ fanbase reach on Facebook is 2.76 larger than that of the Dolphins’. 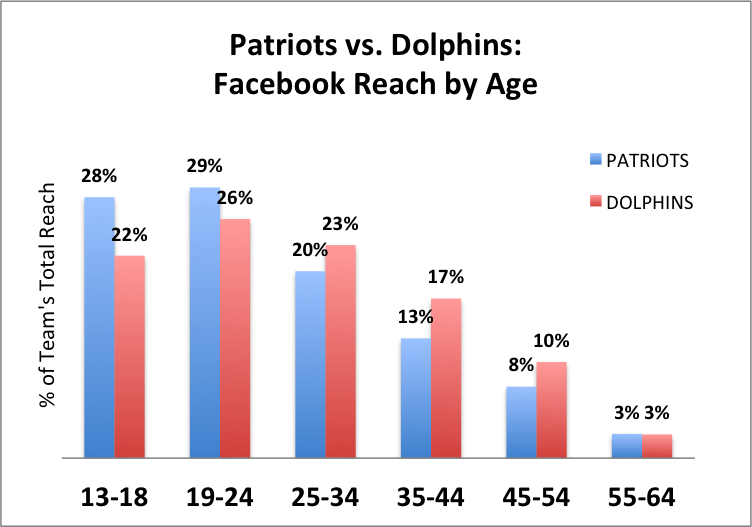 When it comes to the age composition of each team’s Facebook fanbase, the Patriots enjoy a younger fanbase than the Dolphins. 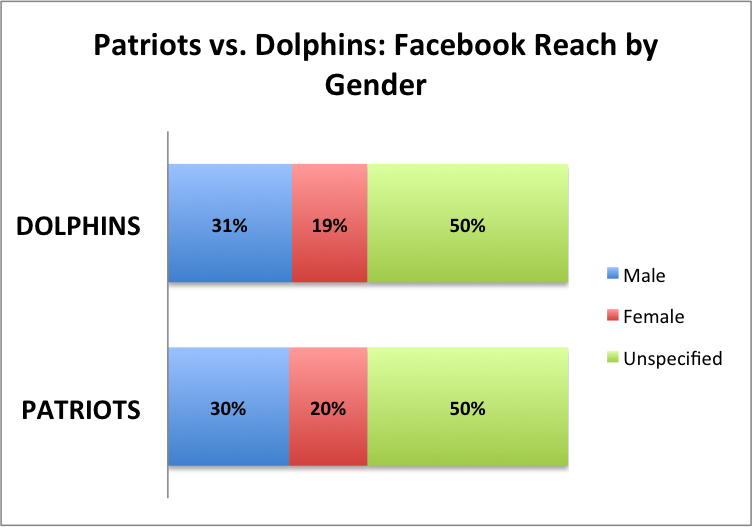 13-24 year olds make up 57% of the Patriots’ fanbase reach on Facebook, as compared to 48% of the Dolphins’. Each team has a similar ratio of female to male fans. “Unspecified” refers to those users who do not list Male or Female gender information in their profiles. When drilling into gender by age range we found the most dramatic differences in the 45-54 age range, which had a higher proportion of female fans than the average. Putting those who do not specify gender on their profile’s aside, this age range’s composition was 54% female and 46% male for the Patriots, and 42% female and 58% male for the Dolphins. The Dolphins’ fanbase on Facebook is more highly concentrated in their home state than the Patriots. 21% of the Patriots’ fanbase on Facebook is from Massachusetts (38% for New England as a whole), whereas 39% of the Dolphins’ fanbase is from Florida. On the other side of this analysis: just 1% of Dolphins fans are from Masasachusetts (5% from New England as a whole), while 6% of the Patriots’ fanbase is from Florida. For marketers interested in advertising to these two fan bases given the buzz around the big game, Facebook suggests a bid of $3.11 for Dolphins fans and $3.03 for Patriots fans — making Dolphins fans slightly more expensive to reach than Patriots fans. Regardless of who you think has the edge on the field, The New England Patriots clearly have the edge in terms of reach on Facebook. *Note: “Dolphin” and “Dolphins” and “Patriot” and “Patriots” were excluded as interests in this reach analysis.